I spent 4 days in Darjeeling over the long Independence day weekend. 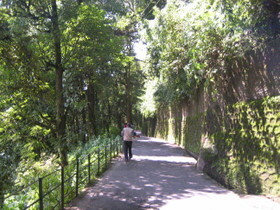 On my second morning at the S.P's house, he invited me join him for a game of badminton at the Darjeeling Gymkhana club. 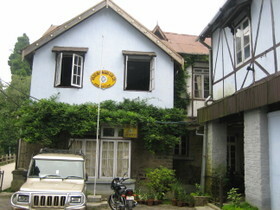 The Gymkhana club used to be the country club for the British babus who would retire to Darjeeling to escape the Indian summer heat. The clubhouse is a charming old place constructed entirely out of wood but it's badly in need for a makeover. I hadn't played badminton in years and was a lousy player even when I did. The S.P. and the regulars easily destroyed me on the court. After losing five straight games to them in pathetically low single digit scores, I humbly etired to the sidelines to nurse my bruised ego with a soothing cup of fine Darjeeling tea. After a hearty brunch, I spent most of the afternoon exploring the town on my own. There were hardly any tourists since it's not peak season in August. It was a beautiful day with the sun streaming in through a canopy of trees hanging over the streets. I visited the Himalayan Mountaineering Insititute where there was an entire museum devoted to the first few expeditions to climb Mt Everest. The museum had an impressive collection of equipment used by Edmund Hillary and Tenzing Norgay to climb Mt Everest. There were also archives of original newspaper clippings relating to their conquest. The S.P. lobbied hard to get the traffic police new uniforms for his traffic regiment in time for Independence Day. He figured it would give them a boost of morale as their uniforms had grown old. 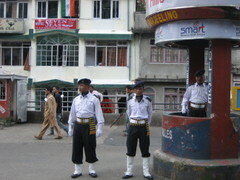 Darjeeling is a tourist town and it doesn't hurt to have spiffy looking traffic cops as part of the scenery.